Nixon Motor Sports: Here Comes the Autocross/NASCAR/Formula 1 Season! We hope you had a great weekend! In the NMS-South area, Brian was busy this weekend with the first weekend of autocross with the South Carolina Region of the Sports Car Club of America. 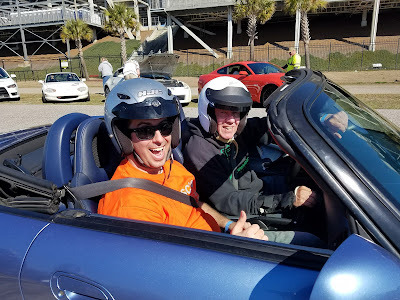 They held an SCCA Finish Line school on Saturday, and then their first autocross of the year at Darlington on Sunday. You also just might have noticed that the NASCAR folks are up and running again, with the pre-season kick-off down in Daytona this weekend too. In an effort to make the racing more fun, more attractive, and keep the fans interested all season long, NASCAR has tweaked the race format this year. So, in addition to having a new series sponsor (out with Verizon, in with Monster energy drinks), each race will now have three parts, and each part will award points. After that, it starts getting complicated, so you might have to consult with an attorney to really understand how this thing works. If nothing else, we believe that the idea is still to drive faster than the other drivers, and hopefully the first car across the finish line wins the race. More to follow on this, maybe that's how it works, maybe not! Formula 1 wise, things start getting interesting tomorrow, when the first new 2017 car unveiling takes place. Since we've gone without any racing since late in November, even the appearance of a new car is news worthy! The first race won't happen until late March in Australia, so at least this week we get new cars revealed all week. After that, there are two different four day test sessions, so we'll finally get to see some cars on track, and check out the new look to the lower, wider, and bigger tire cars this year. Predictions are that the cars will be getting around the average track about five seconds a lap faster, so that sounds like some fun right there!